Professional surfer Bethany Hamilton, who lost her left arm following a shark attack back in 2003, has taken the traumatic experience in her stride and simply gotten on with the job of living her best life. This mum-of-one has gone from strength to strength after recovering from this attack, not letting losing a whopping 60 percent of her blood and nearly dying, slow her down. 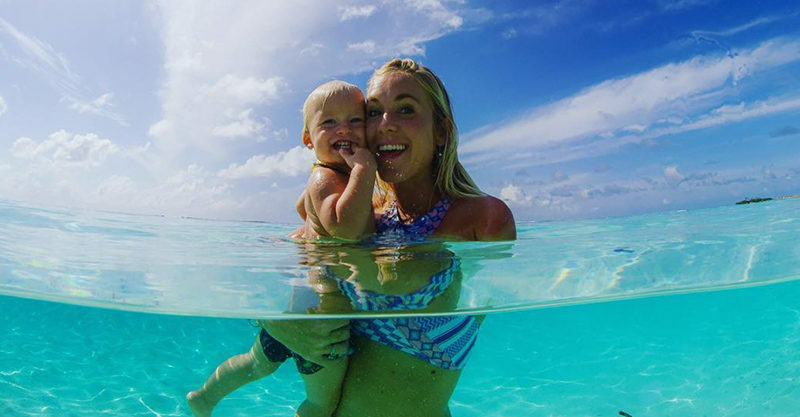 Since then, Bethany’s won countless surf competitions, got married, had a baby, written a book about her recovery and has just announced she and husband, minister Adam Dirks, are expecting a much-anticipated baby number two. The whole family, including the couple’s 2-year-old son Tobias, took to social media to reveal the exciting news. Their little guy helped to deliver the message, pointing at his mum and advising viewers that there was a baby “in there”. He then proceeded to bestow his mum’s belly with a lot of approving kisses. Everyone looks ridiculously beachy, healthy and happy, a well-deserved situation we think, considering what Bethany has been through. Bethany and Adam met through mutual friends and married in Hawaii in 2013. Young Tobias was born in June of 2015 and this brand new sibling will show up some time in early 2018. Bethany said making room in her previously relaxed routine was a challenging but welcome adjustment. “Having a baby, you pretty much have to plan ahead everything, especially [since I’m] nursing him. I’m attached to him in a sense because I have to nurse him every two to three hours,” Bethany told People Magazine. Congratulations to this amazing family on their impending new little person! Another magic board! Aw it's the best when you have a surfboard that works amazing!! !